Check next month for a new Feng Shui Tip! For many people their family room is the most important, and most used, room in their home. It is the room where the whole family gathers to watch TV, listen to music, talk, play games or even eat some meals (although we would not recommend this - dining rooms are for eating.) Many people spend a large amount of their 'at home time' in their family room, so it is important that this room is comfortable and relaxing and has good energy flow. In Feng Shui, the Family and Health Bagua area of any home or room is where you focus on working out family problems and strengthening family bonds. The Feng Shui Bagua area for the Family is the center left part of any home or room, but since the family room has the name 'family' in it, and it is often the only place where the whole family gathers, it is a great place to accentuate the Family and Health Feng Shui energies regardless of where this room is in your home. If it is actually in the Family and Health Bagua area, this is an extra bonus. Start making Feng Shui adjustments to your family room (or the Family and Health Bagua area of your home or any room) now to improve your Family and Health Feng Shui energy. Poison Arrows - sharp corners of furniture, shelves, or any other objects create negative energy directed at anyone that the corner is pointing at. Make sure that nothing is pointing at you while you are sitting in your favorite chair. Also make sure furniture doesn't have sharp points which cause injury or annoyance when you walk past them since this is also a source of negative energy. These poison arrows can cause both family and health problems. 'Soften' any sharp points, either by removing them, covering them with padding, or energetically removing the poison arrow by re-directing it away from you with a Swarovski Hanging Crystal or covering it with fabric or something else which blocks it from view. Clutter - since this is an important room and a place where you and your family spend a lot of time, keep it clean and clutter free. Clutter and dirt cause confusion and lack of clarity and can lead to arguments and illness. Your family will feel more comfortable and live more harmoniously without clutter. They will also be healthier. Conflict - make sure chairs or couches are positioned at an angle. When people sit in chairs directly across from each other it is confrontational. Keep chairs, couches, love seats etc. next to each other or across at angles to avoid arguments and maintain family harmony. This will also lead to more pleasant conversations and make the room feel cozy and friendly. Family Photos - Photos of your family and ancestors in this room will focus your family energy in this room and strengthen it. Place family photos on the wall and around the room to remind you and your family of the strong family bond and connections you all have. Green or Brown - The colors green and brown represent the Family and Health Bagua area, so adding green or brown items such as furniture, rugs, and small items will strengthen the Family and Health Feng Shui energy in this room. Wood is the element for Family and Health, so that is why green and brown are the colors. Any wooden items placed in this room would also represent Family and Health. A family photo in a wooden green frame is optimal. 30 mm Swarovski Health Hanging Crystal - This hanging crystal features the colors green and brown which are the Feng Shui colors for health. It will help improve your physical health when facing a specific health problem, or just generally optimize your health and that of your family. Hang it in the Family Room or Family and Health Bagua area of your home or any room. 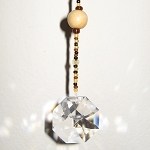 Swarovski Bagua Family Hanging Crystal - This Bagua (octagon) shaped hanging crystal focuses on the Family Bagua area using brown and wooden beads. Hang this crystal in the Family Room or Family and Health Bagua area of your home or any room to improve or optimize your relationships with your family. Buddha with Children Hanger - This Feng Shui Family Harmony cure increases happiness in your family. Hang this Feng Shui Buddha in the Family Room or Family and Health Bagua area of your home or any room to improve your family cohesion.